HKSAR Film No Top 10 Box Office: [2018.01.10] EASON CHAN IS NOT AFRAID TO PLAY "UGLY"
[2018.01.10] EASON CHAN IS NOT AFRAID TO PLAY "UGLY"
The Eason Chan Yik Shun and Li Ronghao starred, Vincent Kok Tak Siu directed Lunar New Year film KEEP CALM AND BE A SUPERSTAR (NGOR DAI GUI SING) will open soon. Earlier Kok Tak Siu, producer Paco Wong brought actors Chan Yik Shun, Wilfred Lau Ho Lung and others for audience appreciation events at many cinemas in Nanjing and Hangzhou. Eason spoke about playing ugly for comedy. He said, "I normally have a high tolerance, but when I was trying on these exaggerated costumes I really had a little struggle inside." 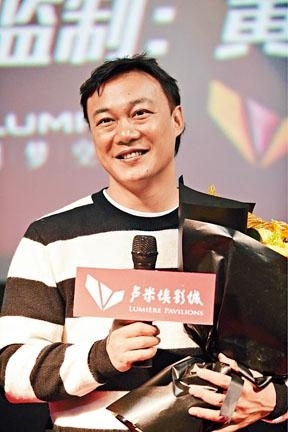 Li Ronghao's buckteeth look also "shocked". Speaking of which one of their costumes was the ugliest, Eason said, "Ronghao's could be fixed with plastic surgery, mine couldn't be pretty even with plastic surgery."